"10 Miles High" is a song exclusive to the vinyl version of The Fragile, disc 1 of the European and Japanese We're In This Together single, and Things Falling Apart in rearranged form. On the vinyl edition of The Fragile, the song starts side 3, followed immediately after by "Please." On the CD and cassette versions of The Fragile, the pregap of "Please" uses the introduction of this song as a segue from "The Mark Has Been Made." ofredearth: "I noticed on the '10 Miles High (version)' off of Things Falling Apart, the intro to the song is also on The Fragile, actually played backwards where we hear 'I'm getting closer...' what was the purpose of 'hiding' it into The Fragile like that and exposing it in the new album?" Trent Reznor: "'10 Miles High' was a full song that had three completely different sets of lyrics and choruses during the course of its life span. When it came time to put The Fragile together, and decide what was gonna get kept, that song took a bullet. But we left a little reminder of it on there, and we put one of the versions on the vinyl version of The Fragile. There are other versions with varying degrees of embarrassing lyrics that are floating around the vaults here." 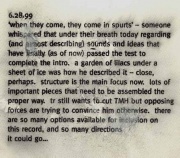 Journal entry from The Fragile sessions in 1999 published on nin.com detailing the construction of "10 Miles High." This version is heard on the vinyl edition of The Fragile and the CD single We're In This Together. Fading in quietly with atmospheric synthesizers and loops at 80 BPM, a high-pitched, echoing melody crossfades into the track proper at 88 BPM, while Reznor's distant, distorted voice repeats the line "I'm getting closer" before drum loops enter. This section builds into the first verse, much clearer and louder with live percussion loops and guitar. A clouded, ambient bridge follows, similar in sound to the bridge of "The Big Come Down", during which high-pitched vocals and acoustic guitar can be faintly heard. A third section with vocals soon erupts, incredibly distorted in a similar manner as the end of "Closer To God". This section gives way to a repetitive coda of distant, layered vocals, which end suddenly. The intro of this song contains a slowed down sample of the two-note flute sound that begins about one minute into "The Downward Spiral". This remix by Hillebrandt is on Things Falling Apart. There are only minor changes to the album version, including a severely shortened introduction, the movement of the middle guitar track to the final section, and the swapping of stereo channels. Unreleased original demo version of the song. Also known as "Hello, Everything Is Not OK" (Instrumental) when it was released on Apple Music as part of The Fragile Instrumental. Both versions are musically identical. Released on The Fragile: Deviations 1, a demo version of "10 Miles High" without vocals. The song uses a vastly different structure from the final arrangement, wherein the riff that only briefly makes an appearance very quietly in the bridge is used as a verse, with the choruses using the more prevalent riff featured in the final version. The opening 'lilacs under ice' sounds are used as the bridge in this arrangement, before erupting back into the chorus riff. "10 Miles High" has never been played live. Previous track - "The Mark Has Been Made" Track 17 from The Fragile Side E (Vinyl only) Next track - "Please"
This page was last modified on 1 October 2017, at 02:07. This page has been accessed 113,101 times.